Fall 2013 | Racing Hearts - Helping to save lives with AEDs. What an amazing 2013! Because of your help and support, we continue to make great strides in our mission of helping to save lives with AEDs. Funded and/or successfully advocated for over 93 life saving heart defibrillators (AEDs). Locations include Palo Alto, San Jose, and Oakland; serving over 134,000 people to date. Increased the safety of over 47,000 athletes with our AED lending program. Provided education about life saving heart defibrillators. Created our first animated video about CPR/AED (created by a high school student, A study published in the March 8, 2013 issue of Circulation: Cardiovascular Quality and Outcomes showed that people who view a CPR instructional video are significantly more likely to attempt life-saving resuscitation). Featured on our local KTVU Channel 2 news - due to a tweet about Racing Hearts from the Fire Chief in Howard County Maryland. View the broadcast. 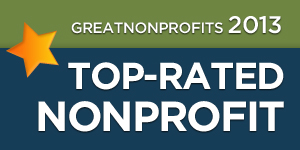 Awarded as a 2013 Top Rated nonprofit from GreatNonprofits! Thank you to our fans! Read our great reviews and add your story! Want to assist in our mission? We have some amazing programs in our future! Help us find AEDs. We will be launching our crowdsourcing AEDSpotter app Winter 2014 to help locate and map AEDs in our community. Look for our "Spot the Box" campaign. Join us for the First Annual Racing Hearts 5K/10K walk/run. Help us continue our mission, consider making a donation. For every $1 donated, we have leveraged $14 of public funds, meaning your impact is magnified 14 fold. We are very proud of our impact! And we would be happy to provide you with a tax receipt! For details and to stay informed, follow us on our facebook page. Thank you again for supporting our mission of advocating and empowering access to saving lives.